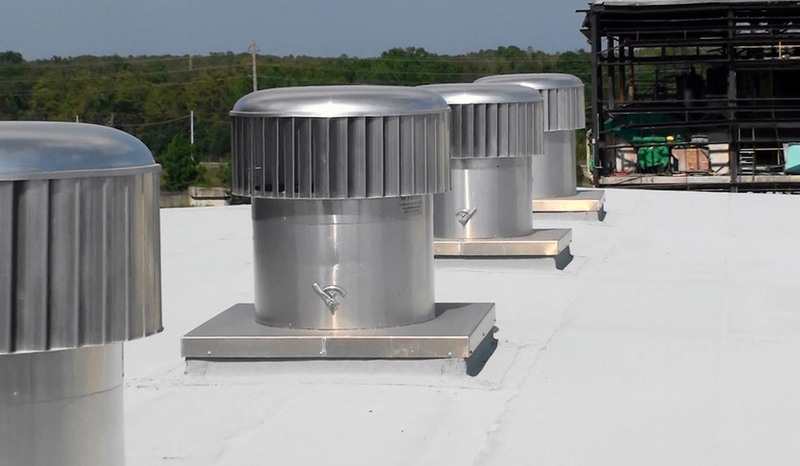 The GreenRoo™ turbine vent spins freely and easily, removing warm air from the building using natural ventilation. It is made of marine grade, light-gauge aluminum to ensure that it won’t rust or seize, even after years of operation. It is designed to spin in the lightest of breezes. Even if it doesn’t seem windy outside the GreenRoo™ will continue to exhaust warm air from the building because that warm air is what is powering it. As the warm air rises through natural convection it flows through the turbine. This airflow causes the rotary vent to spin and in turn draws more air through itself. This self-perpetuating cycle is what makes the GreenRoo™ turbine vent so effective. The aluminum construction places little wind load on the roof. This makes installation easier and prevents the need for expensive support steel. In fact, in instances where a GreenRoo™ is replacing exhaust fans, it can often fit right into the same opening, making installation a breeze. 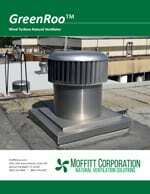 The GreenRoo™ is a big improvement over the old “onion” turbine vents. The GreenRoo is self-flashing for easy installation on a roof slope. It can also be curb mounted.